Forty percent of American millennials (ages 20-36) believe the government should intervene when citizens say something that might be considered offensive to minorities, a Pew Research study reveals. It is not entirely clear what is meant by “intervene” and “minorities,” and the term “offensive” is broadly defined. As usual in the world of Newspeak we go to our standby- the dictionary. Offensive: causing someone to feel resentful, upset, or annoyed. Wow, the eggshell world is here. Despite the threat of political correctness (PC) from millennials, Americans overall still put a high value on free speech, with only 28% in favor of government regulation of speech. Among respondents, 27 percent of Gen Xers (37-52), 24 percent of Baby Boomers (ages 53-71) and 12 percent of the Silent Generation (age 72 and older) believe government should control and limit offensive speech. The dwindling Greatest Generation universally defends free speech, but they are now over age 90. In Germany, a troubling 70% are in favor of limiting free speech. That country will jail those who engage even in revisionist history involving WWII, and even debate on the Holocaust is considered taboo. In fact, it is illegal in Germany to deny or even downplay the Holocaust. The term deny is curious given that no leading revisionist on the topic actually denies atrocities or actions against Jews and others. 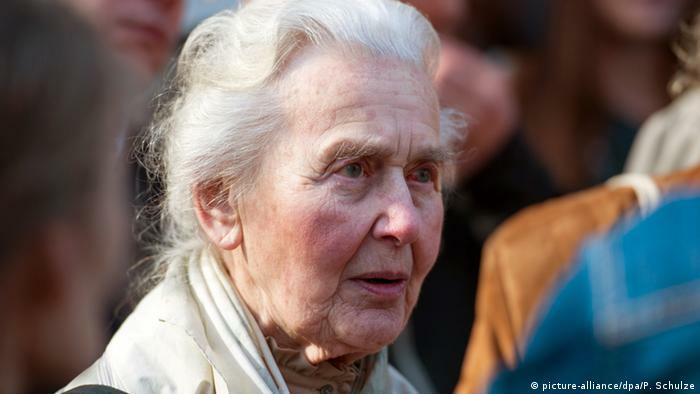 89 year old Ursula Haverbeck was supposed to report to prison to serve a two year sentence for “holocaust denial”. Instead she is on the run, presumably sheltered away someplace by supporters. The Jewish ‘International Auschwitz Committee’, apparently oblivious to the bad optics, is asking German police to use ‘high pressure’ to hunt down and imprison this elderly woman. Update: Ursula apparently went back to her home after five days on the run, and police hauled her to prison. Ursula Haverbeck was sentenced for violating section 220a [see below]. For a woman of her advanced age, this is the equivalent of a death sentence. The following video is the interview that got her into hot water. Watch it before it’s removed from the Internet. The following is an excerpt from the German law, and what a broad and sweeping law it is. In essence, it demands no one disturb the public peace, ruffle feathers or challenge a history that has been deemed set in stone or static. (3) Whoever publicly or in a meeting approves of, denies or renders harmless an act committed under the rule of National Socialism of the type indicated in Section 220a subsection (1), in a manner capable of disturbing the public peace shall be punished with imprisonment for not more than five years or a fine. Please, watch Haverbeck for yourself. See if you can identify her so-called offensive words that “might disturb the public peace.” In fact, Haverbeck was remarkably well composed and was relatively careful in her word choice. Despite the news coverage on her imprisonment, I certainly didn’t hear her “approve of” atrocities or claim they didn’t happen. Do you hear her “rendering harmless” acts committed under the rule of National Socialism? She did go into the rarely discussed — but I think much-needed — topic of the mass murder (Hellstorm) of German civilians and POWs as the war wound down and after the defeat of Germany. Basically, she is “guilty” of processing things outside of the box and not functioning under prescribed terms. Her “revisionism” only involves researching and questioning the size and degree of atrocities against Jews and the aspects of the Hellstorm. She did suggest that truth or history on these topic has been “distorted.” She uses the term “Das Groste Problem” to define this distortion. This is problematic in her eyes because this historical distortion has been used as an agenda to kowtow Germany and promote Zionist power. I’m sorry, but I don’t see “The Great Problem” train of thought as a jailable crime. I don’t see being an aggressive revisionist as being a jailable crime either. Nor is hurting someone’s feelings a jailable offense. Any sensible observer would say that ALL history has been distorted to one degree or another and should be subjected to frequent revision, review and question. Nothing should be set in stone. Courageous Jewish historian Norman Finkelstein has addressed the issue of shaping history and ranking human suffering (uniqueness doctrine) to achieve questionable agendas as it relates to Palestine. This is also what Haverbeck challenged. To help set the facts straight on this case, I believe Haverbeck essentially adopted the work of the French historian Paul Rassinier and probably also French historian Robert Faurisson. The latter focused on the so-called confessions of Auschwitz commandant Rudolf Hoess under severe torture. Since his death, some of his views (such as no gassing in camps within Germany) have quietly been accepted with little notice by the mainstream Holocaust historians. Haverbeck is not an original researcher but has picked up the mantel. Incidentally, Amazon just purged the works of these historians from their online marketplace. TNN has no intention of going into the thought police tarpit of discussion on Rassinier and Faurisson’s outlawed historical revisionism. We have no strong conviction one way or the other and, like most events, especially when the victors write the history, there are shades of grey. There is far too much false dichotomy on both sides of the issue. We do find the notion of a court approved version of events that one could lose their liberty over beyond Orwellian. The “judge” would not permit testimony from a revisionist historian in court. It is fundamental that there should be open discussion, even of controversial views, without threat of prosecution. But if the authorities are willing to make an example out of an 89-year-old woman, well, what more is there to say. I don’t claim to have the answers. But something popped up while reading through the Goebbels Diaries that blew my mind. In the diary there is a reference to Hungary. And it looks like Goebbels the insider and one of Hitler’s closest confidants thinks something completely different is going on. According to the official narrative the deportation of the Hungarian Jews began on April 29, 1944 when a train load of Jews were sent to Birkenau. In ten short weeks 400,000 were alleged gassed there. Did Goebbels not get the word of such a major operation? Curious comments indeed. Some claim Goebbels was lying to avoid incrimination. But Goebbels bluntly said plenty in his diaries to incriminate himself, and had no intention of ever appearing as a defendant before a tribunal. The Führer then explained to the Gauleiters the background of his campaign in Hungary, and how it was designed. He gave an amusing description of his talk with Horthy. He had to use strong-arm tactics because the old man was not comfortable with the necessary measures. The Führer left him in no doubt, that either it would be a fight to the death or that he had to submit. The Führer had so many forces to apply to this campaign that Horthy offered no serious resistance. In particular, the Führer expected contributions from Hungary of food, oil, manganese, and people. In particular, he wants the 700,000 Jews in Hungary involved in beneficial activities for our war effort. 300,000 Hungarian Jews have been detained and imprisoned in the concentration camps. They should come, in large part, to Germany as a workforce. Himmler will take care of this; above all, they are to be used for our difficult war production programs. Our plenipotentiary in Hungary, Veesenmayer, gives an excellent speech on the decisive Hungarian factors. …In particular, it’s to his credit that the Hungarian potential is now in large part requisitioned for our war efforts. Also, the Jewish Question is now being handled more energetically. I insist that the measures taken against the Jews in Hungary have a factual basis. It’s not enough that one only announces in the press what happens, but one must also explain it. In Budapest the Jews are starting to be gathered into ghettos. The ghettos are built in the vicinity of the armament factories, because air attacks are likely there. It is hoped thereby to avoid British-American attacks on Budapest, if at all possible. The notion that the vast majority of Jews sat around passively awaiting their fate is a myth. The Jewish Telegraph Agency has numerous stories of evacuations as the eastern front advanced. 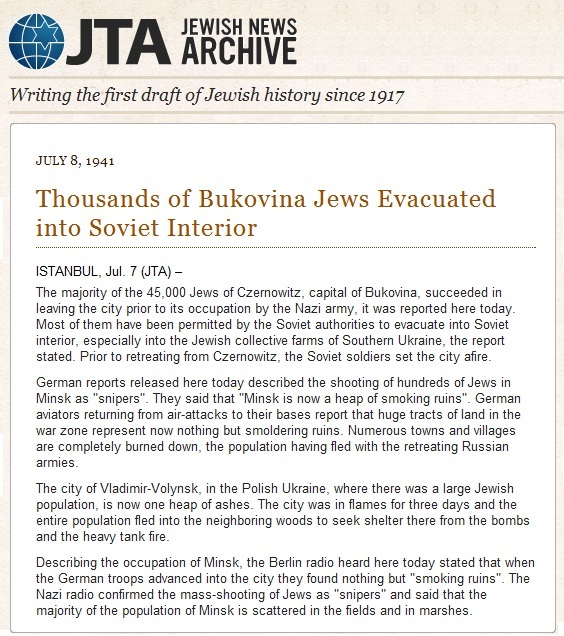 See: [Jewish News Archive, 7/8-1941; 45,000 Bukovina Jews Evacuated to Soviet Interior]and [Jewish News Archive 2/18/1942, Uzbekistan Becomes New Home for Hundreds of Thousands of Evacuated Jews] or fought back. Apparently Goebbels didn’t have any idea about the scale of any killing operations against Jews either. The SD gave me a police report on conditions in the East. The danger of the Partisans continues to exist in unmitigated intensity in the occupied areas. The Partisans have, after all, caused us very great difficulties during the winter, and these difficulties have by no means ceased with the beginning of spring. Short shrift (kurzen Prozess) is made of the Jews in all eastern occupied areas. Tens of thousands must bite the dust, and the Fuhrer’s prophecy is fulfilled for them, that Jewry has to pay for inciting a new World War with the complete removal (Ausrottung) of their race..
Later, indeed these Jewish ghettos near armament factories were bombed by the Allies. One Hungarian Jew in the Yad Vashem interviews who was conscripted to work on the Carpathian fortifications stated that his grandparents and sister were killed in such a Budapest raid. We do find it deeply disturbing that Haverbeck is to be imprisoned at all. And what of those who simply defend free speech and the right of Haverbeck to conduct this interview without prosecution and jail time? Are they, too, going to be subjected via some contorted circular logic leading to derision, ridicule or even prosecution? Support for Ursula Haverbeck can be provided here. Sep 21, 2016 ... In German with English subtitles by DIDI 18. Ursula Haverbeck, the courageous octogenarian previously imprisoned for pointing out the lack of evidence to support the holocaust delusion, here presents details of the planned genocide of the european christian peoples via The Hooten Plan. An 87-year-old woman has been sentenced to prison after she claimed that Jews were never exterminated in Auschwitz. Her criminal record includes two fines and another sentence for sedition. A court in Detmold on Friday sentenced Ursula Haverbeck to eight months in jail on charges of sedition. The presiding judge ruled out the possibility of parole and said that Haverbeck had a lack of "any kind of respect" and that she had made more offensive comments in the courtroom. Haverbeck is expected to appeal against the sentencing. In Germany, anyone who publicly denies, endorses or plays down the extermination of Jews during Adolf Hitler's regime can be sentenced to a maximum of five years in jail. 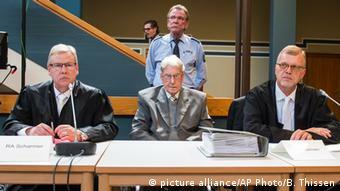 Haverbeck was found guilty of writing a letter to Detmold's mayor, Rainer Heller, saying it was "clearly recognizable" that Auschwitz was nothing more than a labor camp. She wrote her message at the time when the Detmold court was trying Reinhold Hanning, a former guard who served at the Auschwitz concentration camp. The 94-year-old was sentenced to five years in prison after the court found him guilty of being an accessory to the murder of 170,000 people, mostly Jews. Haverbeck spoke about Hanning's trial in her letter, alleging that the witnesses at the trial were set up to prove the existence of the concentration camp. Ursula Haverbeck is known for her right-wing extremist views. Several courts have sentenced her and her punishments include two fines and another suspended sedition sentence. She was on trial last year for saying that the Holocaust was "the biggest and longest-lasting lie in history." Ursula Haverbeck is tonight in a prison cell where she is to serve two years jail. 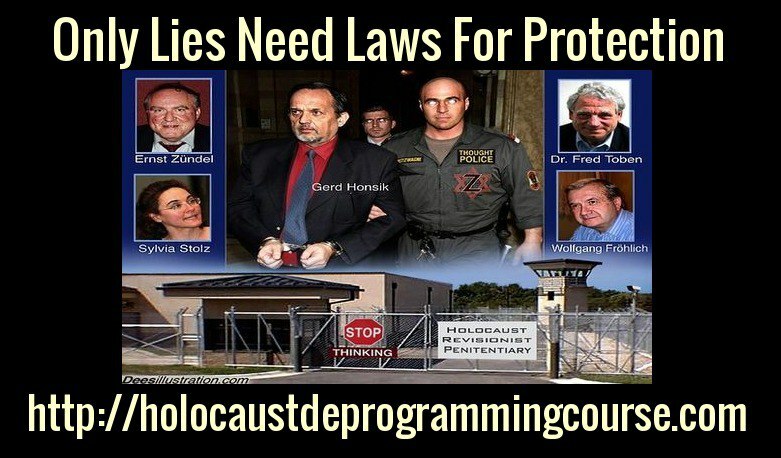 In Washington Occupied Germany (WOG) it is illegal to investigate and expose holocaust fraud. Instead of being honoured for exposing a legal loophole through which tens of millions of Euros are siphoned out of Germany the 88-year old grandmother now faces a lonely cell death. During an arraignment, as crooked as notorious Soviet eras show trials, media hacks submissively clapped the near nonagenarian’s sentence. With breath-taking chutzpah it was the grandmother not the state that was charged with treason. It is well to remember that the constitution and chancellorship of Occupied Germany is illegal under international law. The last legal chancellor was that of Karl Doenitz. Seized in 1945 by the Allied occupiers the Grand-Admiral and Germany´s legal legislators were seized, gaoled or hanged. Since then, WOG chancellors and politicians have first to be approved by Washington DC. In occupied Germany it is a criminal offence to query victors’ propaganda even when the defendant´s case is proven beyond all shadow of doubt. Frau Haverbeck's lawyer argued that the sentence violated their client´s freedom of expression and called for her to be acquitted. The court, likened to a North Korean secret chamber, dismissed the appeal. “We are newspaper readers. Only when we share do we become newspaper publishers and editors.” ~ Michael Walsh. German police are hunting an 89-year-old grandmother convicted on several occasions for Holocaust denial, after she failed to turn herself in to serve her prison sentence. Ursula Haverbeck, dubbed "Nazi-Oma" (Nazi grandma) by german MSM, was convicted in October on eight counts of incitement and sentenced to two years in prison. But she did not report to prison to serve her sentence by the April 23 deadline. After the convict failed to report to the relevant penal institution within the deadline, prosecutors in Verden on May 4, 2018 issued an order to execute the sentence and have charged police with its implementation," prosecutors said in a statement. The convict has so far not been arrested," they added. Haverbeck was once chairwoman of a far-right training centre shut down in 2008 for spreading "Nazi propaganda". She has been sentenced on several occasions to jail for "Holocaust denial". During a trial in 2015, she insisted that Auschwitz was not historically proven to be a death camp. That is "only a belief," said Haverbeck then. She has also gone on television to declare that "the Holocaust is the biggest and most sustainable lie in history". On the 25th. January 2019, at a ceremony at Vichy, France the International Robert Faurisson prize for 2019 was awarded to Ursula Haverbeck. The German lawyer, Wolfram Nahrath – who has represented Frau Haverbeck in innumerable trials – accepted the International Robert Faurisson prize in her place. In his Laudatio Herr Nahrath acknowledged, that it was a great honour to receive the prize on behalf of his client. Ladies and Gentlemen, esteemed committee, Michele Lady Renouf, Master Fallisi, the Honourable Mr. Nichols. It is for me a great honour to accept this prize on behalf of my client. My client, Frau Ursula Haverbeck-Wetzel, last year celebrated her ninetieth birthday, but it is not age or physical infirmity that has hindered her from travelling to Vichy. No, she finds herself in prison in the Federal Republic of Germany. Last year she was condemned in the first instance to three and a half years’ incarceration. A series of further trials against her have been planned and so it is not impossible that she may yet be condemned to further years in prison. The possibility is not to be excluded that she may spend the rest of her life in prison and die in prison. Now everybody is going to ask, what type of fearful and dangerous criminal is my client who has the criminal energy still to commit crimes at her advanced age. Is she the Godmother of a mafia-type criminal organisation ? Has she robbed, murdered, wounded, cheated, stolen, molested children, dealt in drugs, organised human-trafficking ? No, she has committed none of these offences. But in reference to her rights of Freedom of Opinion, Freedom of Speech and Freedom of Enquiry, she has exercised her personal right publicly to question and to comment on one particular event, limited to a particular time and place. She has done so in public and in her writings and at meetings where she was the guest-speaker and she has distributed her literature widely. And, Yes ? - just for this, people are going to ask, you can be locked up for years in jail in the most free (and liberal) judicial ordering that has ever existed in Germany ? Yes, this has happened and this is the fate of the recipient of this prize. Originally Frau Haverbeck-Wetzel was part of the humanist movement and for years she was active in protecting the environment. But it is not a question of just any history. No we are dealing here with the narrative of an organised mass-extermination of human beings, mainly Jewish persons, employing poison gas and carried out on an industrial scale right across Europe up till 1945, and all as ordered by the authorities of the Third Reich. You will all know the figure of Six Million which over time has become the symbol of this narrative. Since the year 1994 it has been a criminal offence in the Federal Republic of Germany to deny or to approve or to minimise this particular event. The penalty for each offence can result in a five years’ prison sentence. For each offence. The Law permits that an adult may be incarcerated for up to a total of fifteen years. It is not my intention here to give a lecture on the political criminal laws in Germany and other such lands. Allow me however to express some thoughts. The Federal Republic and its Basic Law [which serves as the Constitution] has now been in existence for 70 years and the Federal Republic managed successfully for its first forty years without possessing any such provision in Law, [criminalising “disputing, approving, minimising“ that event], without there being any pogroms or other such outrages committed against Jewish persons. It had taken ten years of continuing insidious agitation organised by just a few individuals before the German Parliament passed this law. For ten long years it was rejected. There was massive concern that the proposal was contrary to the Basic Law and to human rights. By employing all the means at their disposal the handful campaigners – I shall call them here the shop-keepers – got what they wanted. Even after its embodiment in German Law, distinguished constitutional jurists and even former judges having served on the Federal Constitutional Court at Karlsruhe opposed this provision; and even prominent persons from the so-called “victim-folk” criticised this new provision and demanded its abrogation; many of them even deny the so-called “Holocaust”. In vain, the provision is still to this day part of the criminal code and many have been jailed because of it, including she who has been awarded this prize. In spite of her age, she was shown no clemency. Just a few days ago, she, who no longer has any living relatives -they have all passed away – she was refused permission to visit the grave of her deceased husband, the humanist Werner Haverbeck. She had wanted to hold a prayer there at the New Year. Refused. Ladies and Gentlemen I am speaking of the Federal Republic of Germany – and not of some despotic banana-republic somewhere in the world. I am of the opinion that the provision Article 130, section 3 of the German Criminal Code does not belong in our Law books. [Article 130, section 3 criminalises “disputing, approving, minimising” the Six Million]. The manner in which it became Law and the motivation of those who made Law are in flagrant violation of the basic requirement of every criminal code in which the conduct of an individual can only be punished if there is a legitimate criminal case to answer. There is no such legitimacy for Article 130, section 3, and not even partially so. The fundamental question is: why may I not dispute and debate historical events ? Who finds such a prohibition useful ? Certainly not the man who wants his Freedom of Speech. I myself was born in 1963. I have not personally experienced this history. At school and in University I was educated to question everything and to freely debate. That was the Credo of our time. At school and as a student we were allowed to dispute, to doubt and deny as much as we wanted without being punished. Any restrictions placed on what we might think or say or on what books or other literature we might read, such restrictions would have seen as a sacrilege against our rights to Freedom – and this remains so today. Such prohibitions make the thinking, enquiring man only suspicious. To the right of a free, unforced development of one’s personality belongs the right to participate with one’s own opinions and convictions in debates and in opposition to others all within the law and also to obtain information freely and unhindered and so to form one’s own convictions. Finally it is an inherent right of every individual to defend the community to which he belongs – that is, his people – from false and wicked accusations including the wickedest. Therefore he has the right to attempt to argue against the accusation that as an historical fact members of his people had committed a genocide and thereby covered themselves in shame. If subjected to the threat of years’ long imprisonment he can not defend his people, then his soul will sicken. To find oneself confronted with legally enforced prohibitions of many sorts, thought-prohibitions, information-prohibitions, research-prohibitions, and Freedom of speech prohibitions, all focussed on a very special event, and when under compulsion of severe punishment one to have to remain silent, even though one is convinced of a very different understanding of the matter, all this creates an oppression which can immediately lead to severe crises of the personality, or in any case can harm the free development of the personality. Such oppression is alien to the contemporary Justice system. This is what happens, I would like once more to stress, when one wants to defend one’s people and its history from the most slanderous of accusations. I will permit myself to briefly classify this law. It is a law born from the religion of the book. And such a law, I reject most fundamentally. I ask for forgiveness that I as the defence lawyer for Frau Haverbeck have not been able to keep her out of jail. This is the first time that this prize has been awarded; and it shows the generosity of the sponsors and their determination to establish Peace in Freedom. What is special in this first case is that she to whom the award has been given, is a German woman. A woman from the so-called guilty, criminal-folk. A woman of noble spirit, full of the joy of life and always laughing, good natured and courageous. If not already previously, then by the award of this prize is she ennobled. Ennobled on French soil by men and women from a people who have had to fight many bloody and bitter wars with Germany; ennobled as a German woman campaigning for the rights of Freedom. This is for me and my humiliated and downcast but so beloved German folk an especially high honour. In the name of she who has been given this award, I thank the esteemed committee from depths of my soul. A sign to give hope for Freedom and Peace.